Does “God” Only Help The Winners? In her Salon column on August 3, Mary Elizabeth Williams asked a question that was probably on the minds of many an Olympic watching non-Christian last week: Did God (really) help Gabby Douglas win that gold medal? Williams then inquires as to whether such statements imply that God is not equally on the side of the girls who didn’t win a gold medal that day and whether such a God is likewise only on the side of the people who survive cancer, not those who succumb (Williams is a cancer survivor). While such a question is integral to an active faith (like Douglas, Williams is also a Christian) there are two things I think one must take into account when considering an answer. The first is that, as humans, we don’t always actually know what is the best possible outcome for any situation, i.e. that a gold medal is the greatest blessing an athlete can attain. I deal with such assumptions all the time in my work. Sometimes the greatest blessings are not what we assume them to be and, only in retrospect, do we realize that they had nothing at all to do with what we wanted. The second, and more important point, is that the magic was not in the medal but in the performance. 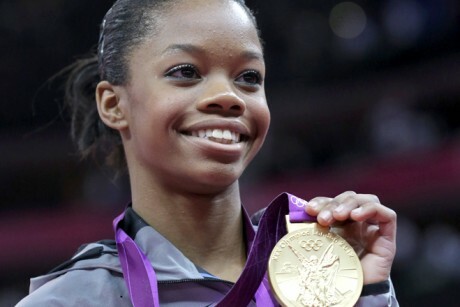 Gabby Douglas is a remarkable gymnast because her performances involve an element of risk that seems improbable. She is a marvel on the uneven bars because, in so many instances, it looks as if she’s flung herself too far into the air to find her way back. Many a time during her routines, it actually seems as if she’s lost – or given up – control of her own body and the outcome of her physical action. During the Olympic competition, Douglas’ routine was so other worldly – so seemingly against some basic assumptions of physics – that I can see why she would credit its success to a force greater than herself. In fact, I believe this is a visible sign of the surrender that is necessary for genius of any kind to be expressed. Douglas does all the work she can possibly do and then gives up the rest. Giving it up, in her case, means…to God. Even if it is only the power of belief itself that makes for her miraculous moves, she is a vivid example of what is possible when one practices faith on the court or, in this case, on the bars. And she has a right to thank God or whomever she wishes to share credit with. Just as we all do, whenever we accomplish anything that flies in the face of our own expectations and seems, at least partially, given by grace.